The Harvard Business Review just published an article based on Play Bigger data science research into how technology companies are producing enduring value. As you know, if you were in the Play Bigger cross hairs this last quarter, you heard a lot from us about our research agenda on how category kings produce enduring value. In fact, we have invested more than three quarters of a million dollars into understanding exactly how timing and age impacts the outcomes of category kings. Our Play Bigger research is highlighted in the January-February issue of the Harvard Business Review. We worked with the HBR team to produce what we think is a very sobering look at the reality of value generation for tech firms. Specifically, the article highlights the IPO Sweet Spot that we discovered in our Play Bigger IPO Sweet Spot Report that we released this month. We discovered the IPO Sweet Spot in our analysis of the value outcomes of every venture-backed company in the U.S. funded since the turn of the century. Since 2000, 4,424 American venture-backed technology companies raised a Series A financing and 69 of these companies went public. We dug in an analyzed the impact of money and time on the value of these IPOs. What we discovered blew us away. Turns out that there is no correlation between how much money a tech startup raises and post-IPO value created. None. Check out the report for the detailed chart that shows this finding. However, there is a material correlation between company age and post-IPO value creation. This is the sweet spot. There is a value sweet spot that exists between 6.5 and 10.5 years where all the value is created post-IPO. 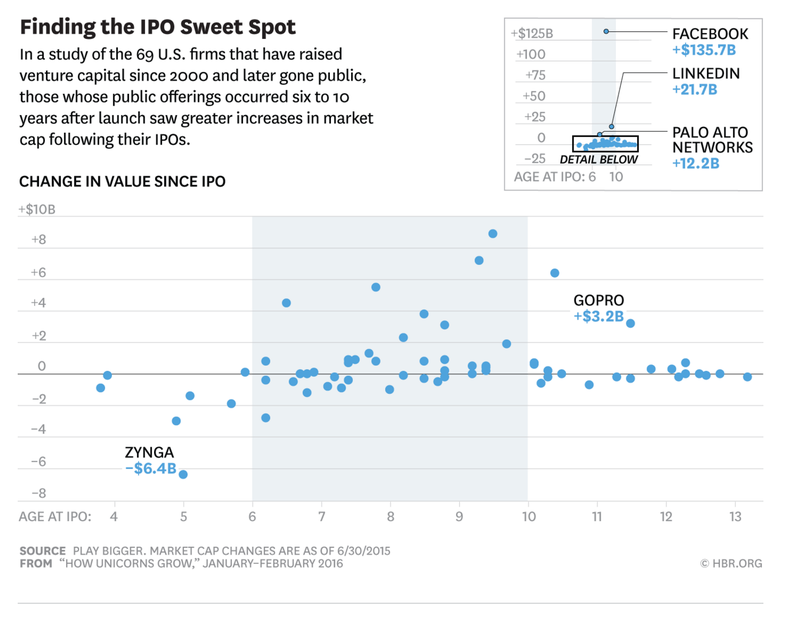 - Companies that hit the IPO Sweet Spot create 113 percent of all market cap created post-IPO. - Companies that go public early destroyed $18 billion in market cap post-IPO. - Companies that go public early are 94 percent sure of losing value post-IPO. - Companies that go public late product very little incremental market cap, just over 1 percent of all value created. So that led us to ask the most obvious question. Why is company age material to post-IPO value creation and success? As you would expect we overlaid the category value curve on top of the Sweet Spot timing and the answer was clear. 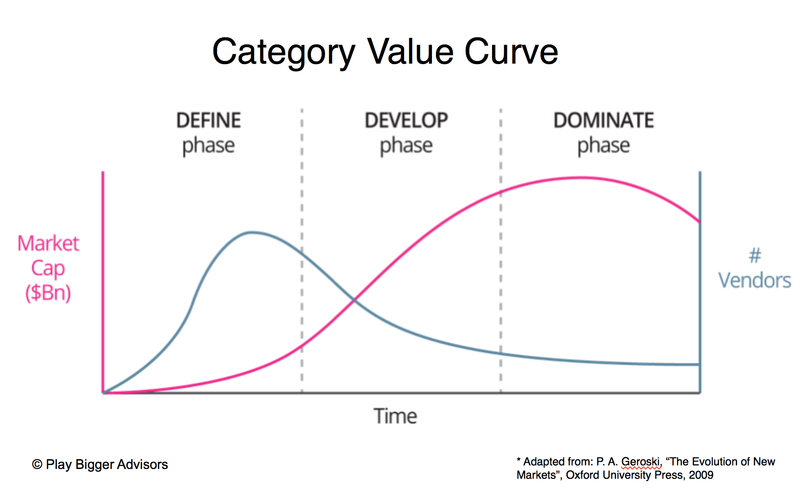 Companies that go public in the "develop" phase of the category value curve generate the vast majority of the value. "The researchers' last finding is more qualitative. The group scored the companies in its sample on the basis of whether they were trying to create entirely new categories of products or services in order to fill needs that consumers hadn't realized they had. They looked at whether firms are articulating new problems that can't be solved by existing solutions and whether they are cultivating large and active developer ecosystems, among other criteria. They found that the vast majority of post-IPO value creation comes from companies they call "category kings," which are carving out entirely new niches; think of Facebook, LinkedIn, and Tableau. Those niches are largely "winner take all"-the category kings capture 76% of the market." So, why do categories matter for producing long-term value? Because, that's the way our brains work. Said in most simple terms, companies and products don't live in space, they live within a container in a customer or user's mind. That container is a category. People need categories to discover and relate to companies and products. This means that category growth is governed by how fast our brains can change in an uncertain new world. So, the IPO Sweet Spot exists because of how long it takes to change people's thinking, behavior, and purchase decisions at scale. Turns out that this takes about 6-10 years. The same time that companies produce the most enduring IPO value. Which, by the way, makes controlling perception job one for CEOs. Which is why the CEO's of tomorrow will be category designers. Download the Play Bigger IPO Sweet Spot Report to see all the details!